With a 4.0-liter twin-turbo V8 producing 550 horsepower and 567 lb-ft of torque, it's hard to call the Porsche Cayenne anything but blisteringly quick. Power goes out to all four wheels through an eight-speed automatic, allowing the Cayenne Turbo to hit 60 mph in just 3.7 seconds. 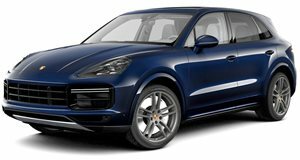 Although it is difficult to imagine a reality where anyone would need more power in their SUV, Porsche won't stop at the Turbo. In an interview with Evo Magazine, Porsche CEO Oliver Blume confirmed that a range-topping Cayenne Turbo S E-Hybrid is on its way. Blume didn't specify an exact power figure but we know the Panamera Turbo S E-Hybrid produces 680 hp and 626 lb-ft of torque from a 4.0-liter twin-turbo V8 mated to a plug-in hybrid system. If the Cayenne Turbo S E-Hybrid produces the same amount of power, it would become the most powerful SUV in the entire Volkswagen Groupe range - even more powerful than the Bentley Bentayga Speed and Lamborghini Urus. In addition to being blisteringly quick, this drivetrain is also capable of running for around 30 miles on electric power alone. We kind of expected Porsche to go the hybrid route when developing a new Turbo S model for the Cayenne but this announcement also includes an important detail for the future. The Panamera rides on the MSB platform, which is shared with the Bentley Continental, so it wasn't clear whether the plug-in hybrid drivetrain would also fit on the Cayenne's smaller MLB-Evo platform. The MLB-Evo platform will also be used on the upcoming Audi RS7, so perhaps we could end up seeing hybrid power in that application as well. Porsche didn't say when the Cayenne Turbo S E-Hybrid would make its debut but a reveal in New York, Frankfurt, or LA by the end of 2019 makes sense.